This approval shows a tremendous amount of change in eight short years. First of all, it is hard to imagine that the Bureau would ever allow the term “vodka” on a beer label. Somehow I don’t think that would fly in this day and age. Further, the qualification seems to mandate the use of this term, in a particular way. 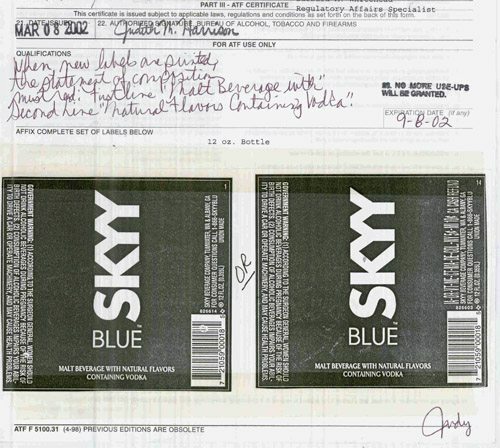 The qualification suggests that the arrangement of the words may lead to controversy, rather than the reference to vodka and a famous vodka brand on a beer label. Pages 12-22 of this document show the controversy. Second, the product is gone. So is the named agency (that is, the label functions have moved from ATF to TTB). So is the person that approved it. Judy was tremendously helpful and probably had many good reasons to approve this label, in a different era. I wouldn’t want to mention the person, but for the fact that the name is right there and the memories are good. This is also a good example of a “use-up.” The approval tends to say the label is not ideal but the agency will allow it to be used for six months only. I believe TTB/ATF has allowed use-ups for many, many decades. It is difficult to imagine other agencies allowing this privilege, such as FDA allowing a dubious label but only for a few months, or Customs allowing a dubious origin statement for a few more months. For these reasons, I wanted to highlight the label before it fades further into history.